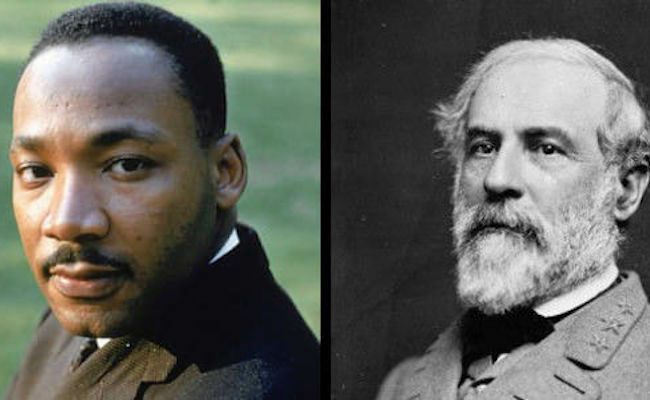 Care2 Causes | Why Does Martin Luther King Jr Have to Share a Day With Robert E. Lee? Why Does Martin Luther King Jr Have to Share a Day With Robert E. Lee? By most accounts, Martin Luther King Jr. and General Robert E. Lee don’t have much of anything in common. The former was a civil rights pioneer who promoted equality for black Americans, while the latter led the Confederate troops to secede from the nation and maintain slavery. However, in a couple states, these two disparate men have one dubious distinction in common: they share a holiday. Believe it or not, both Alabama and Mississippi honor these men on the same day in January. It’s a tradition with a highly conflicting message that ought to be discontinued, and Care2 has a petition asking these states to do precisely that. Slate contends that the pairing of the men’s holidays isn’t necessarily as nefarious as you’d worry. When the U.S. Congress instituted a holiday for Martin Luther King Jr. in the 1980s, certain southern states decided to move their own traditional Robert E. Lee Days to the corresponding third Monday of the month to limit the number of work holidays. Lee was born just four days (plus 122 years) apart from King, so the timeline matches up, anyway. Of course, that overlooks the notion that a slave-owning traitor to his country probably doesn’t deserve a holiday in the first place. With lots of southerners still defending Confederate statues as important parts of their heritage, though, the backlash to getting rid of the holiday altogether could potentially be immense. Given the magnitude of the Civil War with hundreds of thousands of soldier casualties, it’s improbable that General Lee will ever be forgotten, as amateur southern historians seem convinced will happen if the holiday is removed. Remembering his role in a historical context and commemorating him with a state holiday are two totally different things, however. If nothing else, King and Lee’s holidays shouldn’t be synced up. Proving they’re somewhat more decent than Alabama and Mississippi, a few states including Virginia and North Carolina that formerly jointly celebrated the holiday have passed laws to separate them given what a mismatch the honorees are. Starting last year, Arkansas finally followed suit, too, pushing its celebration of Lee to October. As it stands, having a day to jointly recognize King and Lee seems like that same “very same fine people on both sides” nonsense rhetoric that President Donald Trump spouted in the wake of the unrest in Charlottesville, Virginia. We should be commemorating people who pushed this country forward like King rather than divisive figures like Lee. We’re long overdue at getting Robert E. Lee Day off the calendar entirely. Sign this petition encouraging Alabama and Mississippi – plus other states like Arkansas and Florida that still honor him, as well – to finally end this unnecessary tradition. Both were leaders and very smart. They knew how to lead. So why not celebrate them both on the same day? Afterall they weren't present in the same era. On the bright side, Robert E. Lee's blunders at Gettysburg virtually assured the Union would win the war.